this is the recipe, right click this link and choose “Save target as..” to download it. Notice that all the ingredients are listed by calories, we’ve analyzed every recipe in Dog Food SECRETS and boken the ingredients down by calories which is super-useful for deciding how much to feed you dog. sneak yourself a mouthful of this too because its yummy! Thank you for all your hard work developing with new feeding method! I have a 11m/o mountain cur (I think, we rescued him when he was abandoned at 4 months old and starving, beaten, and filled with worms) He has no allergies and will eat anything! Rocks, worms, wood, plastic, but we keep all that out of reach. I want to feed him using this method because I had just lost my 4 year old pit/ border collie mix to cancer, and he also had allergies to wheat and corn. I want Jasper to live a long healthy life and never have to go the way Jack did! Again, thanks so much for helping my dog live his life fully! We’ve had labs for the last 20+ years, great dogs, wonderful dogs real friends and buddies. Had a litter if 8 puppies, wonderful, loving puppies. My bigest complaint about labs was, they don’t last(LIVE) long enough! Figured it was because of the intensive breeding on down the line. we fed the best dry dogfood, we thought. My wife works for a vet(11) years. Haven’t had a lab live past 10 years yet. Lymphoma, myloma, spleen cancer. We killed them? Didn’t know. I have a puppy that I’m going to pick-up March 1st, 2013. Just born last Friday. The breeder says he’ll send a bag of”Black and Gold” dogfood home w/ the puppy. 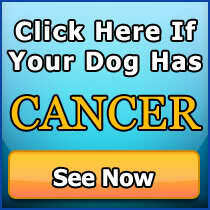 Think I’ll pass on that and see if THIS dog can have a much longer and healthier life than my prior friends. I’m really, really thankful and counting on you.Puppy’s name will be Sundance so every day will be a Sunny day. I have a 5 year old Great Pyrenees named Maggie, and because we cannot afford to feed her like we eat, we give her Ol’ Roy meat chunks N gravy. I wanted to know your opinion on this brand and if maybe you could recoment us something better for my Maggie that isnt too costly… I dont want to lose another dog to cancer. I am brand new to your site and your research. I am a Labrador lover for over 38 years. In fact Labs are the only dogs that I have ever owned except one Cocker Spaniel when I was a child my Grandmother got for me. I have trained, field trialed and hunted labs from my first dog AKKA in 1975. I found your site while I was online a couple days ago looking for another Lab. Friday Sept 28 at 4:00 PM I lost my White lab Abby of 12 years to cancer. She was our in house family member and she will be missed for years to come. She was a very special lab, extremely smart and just the best temperament you can’t imagine. Over the years I have had over 16 Labradors, most of the time 2 and three at a time and even now I have 2 that are trained that I hunt with. Duke is 5 years old and Eddie is 5 ½ years old. Both are very very good bloodlines and great hunting dogs as will as my buddies. I have not yet, but plan to as soon as I can buy your book to change their food from commercial food. My question to you is, considering them being high energy dogs and working dogs hunting and field trail dogs are your receipts sufficient or are there specific other receipts needed for this type of dog? Monte, I’m sorry to hear you lost a beloved family member… it is always difficult and I feel for you, its a sad, sad time in your life. You are the first person, believe it or not, to ever ask me this question of feeding a dog based on activity level. I’m so glad you have asked because for the longest time Dog Food SECRETS has contained feeding instructions also based on activity level. Highly active dogs will require more calories rather than a different type of diet and we have charts allowing you to easily calculate how much to feed based on a combination of age, weight and activity level. Thank you for the info..I WILL CERTAINLY TRY IT AND COMMENT. I read about different things that people feed their beloved doggies. I am really confused about mine..i have a long coat German shepherd who is 17 months now..we used to give him boiled chicken with rice and broken wheat. Sometimes mixed with veggies..he hates veggies and fruits..does not touch them at all..now after a lot of research we have switched to raw diet..he doesn’t mind it but doesn’t like it a lot..because the weather is very heaty in India..he doesn’t digest goat meat unless its raw..our issue is his lose soft poo almost all the time..please suggest what to do..
Tag loves The Terrier Tuna, Egg & Cheese Supreme. Tag is a 9yr old JRT that is as crazy now as he was as a puppy. I made the recipe one morning at 4:00AM,finally got Tag out of our bed, finally got him to come down stairs. He realized I was cooking and was wide awake. He ate like he was starving which is something he never does. This recipe has made him the perfect alarm clock. He is on the bed every morning about 4:00AM staring me in the face wagging his short tail. He’s the first one downstairs and to the kitchen. We have a rescue JRT female that loves it also. Joseph, I love stories like this one… thanks so much for sharing!! I\’m really shocked about what I\’ve learned from your website and blog. i have 23month old male Shar-Pei who has allergies. I\’ve tried all sorts of different commercial foods and he is still nibbling his paws (which are red raw). I\’m excited to try this new tuna recipe. im glad i clicked on your website ive been disturbed about dogfood ing.& which types to buy for a long time now,thanks for the info & recipe,my two dogs are part of my family and i dont mind cooking for them. I totally agree Amanda… too many dog owners are content to rip open a bag and poor lifeless, loveless, poisonous garbage into a dish and feed it to the animal they love. It happens because for several generations now, dog food companies have been spending millions of dollars daily to convince us food from a bag or a tin is everything your dog needs…. but if we step back and think about, that makes no sense at all. If we fed ourselves from a bag or tin for every meal of every day, how do you think you would feel? Dogs are no different, they don’t have an immunity to low quality food, they are susceptible and will become ill and diseased just like common sense would predict. Big dogs generally have the same requirements as smaller dogs except for maybe an increased need for calcium and phosphorous due to the greater load they place on their bones. Surprisingly smaller dogs have higher bone density than larger breeds and therefore less requirement for these 2 bone building minerals. I’m so sorry that I did not find your site years ago. My Shadow has just been diagnosed with a bone tumor. Don’t know the type as I can not afford extensive medical research. From what I’ve resently read,by the time that one notices the swelling and limp that it’s quite advanced. I am immediately changing her diet! From now on my best friend will eat as well as I do. I have ordered some suppliments from K9 which are supposed to help boost her auto-immune system. Shadow is a Black Lab X Dobermann and she is quite large. (110 lbs.) She is my best friend. I’ve had her for nearly 12 years now. And her vet says maybe 4-6 months. That’s more than I can handle. NOW, I know what animal by-products means! I have rescued a Rottweiler from the highways. Sweetpea at 3 years old will never be fed commercial dog crap again. Why Sweetpea? Because she is the sweetest most loving dog I have ever seen. Yes, more loving than Shadow my best friend. With a better diet and the suppliments Shadow may have a chance at remission. Thank You for your information. Go on TV and spread the word. I just watched your video on the Terrier Tuna Egg and Cheese Supreme. Please email that recipe to me. I have a 5 yr old female Shih Tzu that we have had 4.5 months. She is a rescue and was badly beated and abused. She was in critical condition when we picked her up. She is doing great but is a very picky eater and I cannot find a food that she likes. Sometimes she will eat grilled chicken breast but that isn’t even regular. What do you think of Blue dry food? I want Lucy to only have the best in everything. Jo-Ann, dogs are not carnivores, so you must give a balanced diet. If she is fussy, put the food out and don’t give her anything else… if she doesn’t eat it she gets nothing. Its tuff love but eventually, she’ll be hungry enough to go and eat the food you put out for her. I’ve lost my last 3 dogs early to things they should never have got, one to epilepsy (onset at 8yrs and the drugs were worse than the epilepsy! ), one to a ruptured spleen at 6 (with no trauma)and one to bone cancer at the age of 5. I keep trying different breeds (despite having chosen mine carefully not to be ‘in-bred’)and now have a cocker spaniel bred by my sister, but I think I may now have found the answer to the puzzle of how one person can have so much bad doggy luck. What you say makes so much sense, but it is hard to change everything you belive, having always fed what I’ve ever been told by vets, breeders, obedience trainers etc. Two questions, in these difficult times I can hardly afford to buy meat for us, let alone the dog, so are your recipes expensive? Secondly, is the stuff in your book easily available in the UK and does your pet food research recommend brands that are available here? You’ve certainly got me thinking, I’ll continue my research! In the meantime, here’s hoping that Ben will have a long and healthy life denied to Mala, Finn and Cordy. I will never forget them and the times we shared, but am angry to think they may still have been able to be with me…..
Kathy, so sorry to hear your dog’s died before their time. I agree, the food they ate played the biggest role in the health problems they had. In one of the testimonials I have, a woman adopted a retired greyhound with epilepsy and was having a terrible time until she changed to one of the food brands I recommend and the epilepsy stopped almost overnight. Cancer is very closely linked to food and a ruptured spleen without trauma points in the same direction since it is part of the dog’s food processing mechanism. Your question about the expense of cooking home meals is a great one. I personally don’t cook every night for my dog… instead I cook a large batch once every 3-4 weeks and freeze it. Compare that to a large tin of good quality dog food which is about $6 and probably contains 3 meals of MUCH, MUCH less nutritious food. That’s $60/mth or $2/day. Home cooking wins on all points because it is not only much healthier but also much cheaper. Our researched brands are Nth American brands but I still recommend it to other country residents since we list all the ingredients each contains and you can use that as a guide to selecting domestic brands. I subsribed to your Gold package recieved confirmation money had been paid ,but I,ve done something wrong as there was nowhere to put my address can you help. I have been feeding my dog things like rice, beans, oats, and veggies for the last week or so, and found his fat pouch around his tummy and the couple small fat lumps around his sides have already disappeared – amazing! He is 7, and we hope our baby lives a long, healthy life! Haven’t tried the tuna recipe yet, but will do that soon. Thanks! Hi Andrew, I am saving to buy your book but at present I have three dogs.a Border collie,A collie Rough and a German shepherd. I have always fed my dogs on raw beef, raw vegetables and a variety of dog kibble.They also have fish oil,apples,sardines,eggs,bananas,watermellon. I don’t give them cheese as I thought it was bad for them.What I need to know is it good to feed raw food rather than cooked food. This is a common question I get and I answered it many times.. pundits say raw is more natural but dogs have been domesticated for over 10,000 years… that’s a lot of generations eating food given to them by humans, plus all dogs came from wolves and virtually all non-wolve breeds of canine are the result of breeding, so the everyday dog is far from the type of dog that evolved eating a raw diet. Raw also can have microbes that are harmful. we tried out your recipe for terrier tuna egg and cheese supreme yesterday morning.our 14 month old pit bull,Bella,loved it.it was gone in a minute! we also made her a meal of brown rice,ground turkey,and peas cooked in a little canola oil for dinner.she loved it.we are waiting until we save enough money to get your book but our dog loves eating this natural way.i think she should eat the way we do.we don’t like processed food and additives.we look forward to buying your book.thank you.oh,how much should we feed her each day? she is 53 pounds right now. how much you feed her will depend on her activity level and also whether 53lbs is an ideal weight for her of if she is under/overweight. 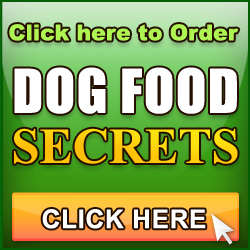 Dog Food SECRETS comes with a full exaplanation on how to decide. I am glad to see this post. I have a 4.5 year old Pit bull named “MOOSE”, his weight is approx 70 – 75 lbs. I was wondering how much of this recipe I should make for him! He will eat just about anything.. I do also try to feed him healthy foods so he can be around for a long time. Thanks for all the tips…. You welcome Tam, how much you feed Moose will depend on how many meals he is eating per day. This recipe is an easy favorite but it is meant more as a snack or breakfast rather than a whole meal. A whole meal should also contain vegetables and a complex carbohydrate. Everything is explained in Dog Food SECRETS and every recipe comes with a portion guide for 5 different sizes of dog. I have two Giant Sshnauzer puppies. The breeder says she has them on Blue Buffalo Puppy, chicken. Is this a good dry food? My dog is a maltise x mastiff. and she is BIG. yes her dad was the mastiff and a step ladder was not needed. i got a recipi here for a small dog . she has to be about 55 60 kg do i just double up and is it going to do her much harm if i buy the gold and black meaty bites for her evry second day? i try to swap between the cans and the meaty rings so shes helthy but i understand this stuff is not good for her? Definitely never use a “Black and Gold” or “No Name” type discount brand of dog food because its poison in a can. Yes, you need to dish up more. All the recipes in Dog Food SECRETS 4th Edition have a serving guide for 5 different dog sizes, including large and x-large breeds. I have a 7mo old Blue Heeler that I’m having a hard time keeping weight on- he runs it off! Meantime- hes looking scrawny! Part of it is just his age- the lankyness- vet says hes healthy. But I’m concerned. Hes gotten terribly picky in his eating habits- he shares my sons meals- he wont touch dog food anymore (cant say I blame him, looks nasty) I have been baking chicken breast and rice …he loves it. Now I’ve got your recipe-this dog eats as well as we do! And we wouldnt have it any other way! Fantastic Kathy, you have a very lucky dog! Hi, i have just gotten 2 yorkie puppies. Im looking for a really great food to feed them. not to much in to the ideal of cooking food my self. i have 4 boys and that is like feeding the army. So if you can just suggest me one brand for small pups and small dogs i would be ever so greatful. been doing a lot of research and i just cant figure out what i am looking at. Paula, there are 1000s of dog brands and many more released weekly so I dont have advice on every brand sorry. All I can say is this one is not on our recommended list. All of the foods on our recommended list which comes with Dog Food SECRETS Gold has been selected because it is as good as it gets. I’m about to try your tuna egg an cheese supreme on my little Lucy shes 13 pounds and shes just become very fussy about what she eats I’ll let you know how she likes it. I hope she likes it, seems popular even with fussy dogs. I have a 5 month old Siberian Husky. I feed him Calfornia Natural Puppy Food, and was wondering what your thoughts are on this company. I have concerns about him getting the proper vitimans and minerals on home recipe diets. Don’t know it Bob. Pups need a higher protein diet than adults. They go thru 3 stages of feeding before reaching the 4th stage which is an adult diet and at 5mths your dog would be in the 3rd stage. Dog Food SECRETS now comes with a puppy feeding guide including recipes for each stage. We would have to coerce, bribe, threaten to take away, hand feed, lap feed, and many other methods just to get our 60 lb. 2 year old to eat his dry dog food. He is our first rescue and we have had him for a year but his eating habits had us in a quandary. We followed the instructions that the foster mom gave us as to his feeding but in no time he became “funny” about his meals. I mean downright not doglike at all. He would protect his bowl but not eat his food. I noticed that if I gave him Beneful canned dog food as a special treat, he did not hesitate one bit. I said to my husband, this stuff really smells good, it almost smells like homemade. I check the ingredients and much of it was what I would normally cook for us. Also, our former 3 dogs were all given table scraps besides their dog food. Our 50 lb. mutt lived to be 14, our beagle was badly traumatized but mainatain optimal physical health until he was 12, our Toy Fox Terrier live to a ripe old 16 12 years, even though he was badly arthritic and could barely leave his bed. His organs shut down one day and we had to put him down because even if the vet did what she could we figured at 16 1/2 years and badly crippled, Gweedo deserved the rest. When Gweedo was diagnosed with a birth defect that prevented his injured leg from healing, our vet had put him on steroids to strenghten his leg muscles and stated to start feeding him fruits and vegetables so he would not gain weight as a result of the medicine. Not knowing the vet was talking about dehydrated fruits and veggies (or maybe he wasn’t, after all) I begain supplementing the dry food with an occasional topping of people food leftovers, or green beans when I was cleaning them, or potato chunks when I was cooking, simply because he would drive me crazy until I gave him something. Gweedo ate, among other things, raw broccoli, oranges as well as orange juice, tea, nectarines, peaches, pears, plums, spaghetti and meatballs, tomatoes and cukes, facial tissue, paper toweling, (don’t encourage this), and just about anything else we ate as long as it was not too salty. Not once did he get sick to his stomach on any of this food and I now believe the reason he lived so long, other than being a downright stubborn terrier, is because of his varied diet and of course the excellent care of both vets he had during his lifetime. Our newest is, of course, Marley, and I am now making him his dog food and no longer do I need to beg him to eat. As soon as I head for the refrigerator, he goes and waits at his bowl because he knows what’s coming. I am new at this but I am enjoying all of it immensely. Watched your video yesterday and made the the tuna and eggs. My two Bichon’s loved it and so did I!! I also gave some to one of my cats that loves most everything, and he also licked his dish clean! I too, have a hard time affording the higher end grain free dry foods for both my cats and dogs. I do give my dogs chicken,cottage cheese, certain vegetables, fish, etc., along with their dry food which is not a grocery store variety. I am looking forward to purchasing your book as soon as I can afford it. Your site is great and you do a great job on your videos! Wish I had found it sooner! I have lost a cat and a dog to kidney disease and I am convinced it was because of the dry food. Well thank you Linda, always lovely to hear nice feedback. I also lost a dog to kidney disease which my vet confirmed was from his commercial diet, that’s how I got started on this track. Thanks again. Thanks for the recipe. Perhaps I’ll try it for Floyd one day, when I am caught short without his regular home-made food. I’m sure he will enjoy it. Not trying to be critical, but why are you cooking their food? What’s wrong with all raw? I feed my dog the BARF diet (you’re an Australian, you must have heard of it). I make a batch for him once a fortnight, freeze it in portions, and he is lean, healthy and happy. He does really good poo too – not mountains of revolting smelly stuff like dogs do on commercial food. The only cooked food he gets are the home-made biscuits I make him. They contain all good things including Vegemite. Oh, he does get some table scraps but I live on my own so there aren’t too many of those. I guess whether cooked or raw is just a matter of preference, and I prefer raw for my boy. Are the dog food industry rules and regulations in Australia the same as the US? I suspect they may be. I thank you most sincerely for your website. I came across it months ago just after I got my dog and was looking for an alternative to feeding him commercial food. I felt shocked, sickened and horrified at what I read, and it made me determined to find a better way. There are no “animal byproducts” going down my dog’s throat! You have taught me a great deal. I have been reading about diffent foods for dogs. I thought that milk products were a big “no” in their diet? Please clarify. I have a 3 1/2 year old rough collie that is diagnosed with kidney failure. Does Dog Food Secrets contain recipes for kidney issues? Keri, Dog Food SECRETS now comes with a book called “Recipes for Dogs With Special Needs” which includes a recipe for kidney problems… sorry to hear and I hope it goes well. I have a yorkie terrier that’s 10 years old. Whenever he eats cheese or fish he gets gas, so we\’ve opted not to use this recipe. We\’d like to mix kibble with homemade foods since we are trying to get his weight down, do you have any meal suggestions for overweight senior toy breeds? We\’ve been feeding him and our other dog (a toy poodle also 10) Nature\’s Recipe which was suggested by their vet. This brand of food has helped but with his advancing age and the development of a collapsed trachea exercise isn\’t really an option so perhaps an addition to his diet will. I would avoid using the kibble because it will be high in fat but low in nutritional value. If you want to keep weight down, use nutritionally rich foods high in fiber so nutrients are released slowly into your dogs body. I suggest you try a diet of low fat meat with brown rice (or oats) and green vegetables. Do a ratio of about 40% protein. Dog Food SECRETS now comes with a guide for Special Needs which includes a weight loss recipe. I have 5 dogs anything I can make that can feed all of them healthier than the dry dog food I have been buying cause I know the video talks about the dry dog food being unhealthy for them.I also need to find some healthy food for my growing st. bernard he is so cute. I need to read up on finding some food that will support his bones since his breed needs that any ideas of where to search and what would be really good for him. 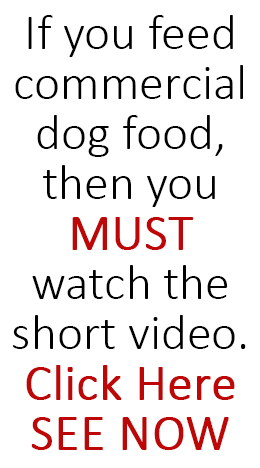 I was absoloutely horrified to read about the dog food from your link on youtube. I just cannot believe that this is actually true? I am feeding my 2 chihuahuas either on IAMS or SCIENCE PLAN (a food that is reccommended by vets) Which i thought were balanced healthy diets? they are not cheap dog foods, and cost £15 a bag!! Is this a way to get people to buy your books, or is what you say, a legitimate argument? If all what you say is true, i cannot believe i have been feeding my babies this stuff…..
Hi Tara, its all true. Every claim made by me is supported by verifiable references. I didn’t make this stuff up, although its so drastically different from what dog food ads tell us 24/7, I understand why dog owners have difficulty believing its true. Hi, Great receipe. I Cant wait to try more. I Work 12-14 hours per day 6-7 days per week. Although I do plan to make much of my dogs food, You mentioned that there are a few that actually meet your standards. Is Nutrapet one of those few? If not what is? Occasionally I need to supplement, but only want the best for my babies. Do you have any recipes for cats. I have just become aware of your information. I have a beautiful 4 year old mix–but primarily Norweigan Elkhound. He continues to gain weight in spite of my walking him or letting him run at dog park. I am using Wellness low fat food. He does get treats when I am working with him but this is usually bully chips. Do you approve of the Wellness line of Dog food? He is now recovering from serious surgery but we are getting ready to start walking and I hope running. Yes I like Wellnesss. Try feeding smaller amounts more frequently and replacing some of his meal with high fiber foods like green veggies, rice and oats. is scince plan a healty dog food. Science is not one we recommend and mixing with dry is only a good idea if its high quality. You’re dog definitely needs veggies so add some of those in too. Freezing should work fine Dee, its something I recommend for our recipes. I sent an e-mail yesterday, but I dont know if you recieved it. My question is, my wife and I are about to get a new Golden Retriever pup in the next week doses your book cover making meals for new puppy’s? Hi Mike, sorry didnt see the email. Yes, Dog Food SECRETS Gold Pack now comes with a book just for puppies which covers the 4 stages of puppy feeding with recipes and guidelines for each. Wonderful Beverly! Thanks for your gratitude. I worked in an abattoir when I was in my late teens and the pet food vat was the most disgusting thing I have ever seen, even 20 years later. I write about it in Dog Food SECRETS. We are new to your site and looking forward to visiting more! We had an Aussie, boarder, queensland mix for 19 years his name was Tippy. Tippy ate only people food all his life, along with milkbones for a goodie. When we got our Labardane from the shelter, we thought we would try out some store bought dog food. BIG MISTAKE! When ever Barky would eat then drink water, he would throw up his food. So I went back to feeding people food, when I cook for us I just cook for three instead of two. He has not thrown up since and it has been over a week now, and his coat looks better too. I am soooo glad I found your site, now I feel I have back up when my friends tell me I shouldn’t feed people food to a dog. I feel our Tippy would not have lived for 19years if he ate store dog food. 19 years! That says it all… 19 years for a dog of that mix is VERY old, well done. Glad you’ve made the decision to stick with the home diet… your experience is a great reminder to the rest of us of how diet can make such a difference in the life and longevity of a dog. I know my pups would love the tuna recipe. My concern is canned tuna. Doesn’t it have mercury in it? Should it be wild caught? Should the eggs be organic? Should the cheese be organic? Cheese is processed. Shouldn’t we also be concerned about these issues as well??? Hi Kathy, taking it to the nth degree… yes we should be concerned about these things too. But approaching it from a more practical and manageable standpoint, even this recipe, as imperfect as it is is many, many times better than commercial while still being very quick and simple. If I taught only to take to the nth degree, very few people would do it because of the committment and resources it requires. I received your E.Mail to-day thank you. I cant comment at the present but I have to go out later and will make a point of getting the neccessary ingredients to make up this recipe for Merlin and lassie as well. (Lassie is a border Collie cross.) I am sure that they will both enjoy. I will duly let you know how they get on with it especially as Merlin is getting fussy about what she eats. I have purchased your Dog Food SECRETS and have been feeding my 2 1/2 years old Meekah (Chi) and Harley a 3 year old Zuchon these wonderful recipies. They love everything I have tried so far. And they are quite yummy…Have been cooking these up for about a week now. Twice a day. You just became my hero! The breeder where I purchased my new Bordeaux girl suggested Optimum dry food which is made here in Australia. I have looked it up and have seen it at my local supermarket. They say it has been researched and developed at Whaltmans. So far, according to the labelling, it seems like it might be ok, but will do some more research on it. I think our labelling laws and the laws for ingredients in these products are a lot better here. I am also waiting on a second reply from the University of Sydney, Dr Paul McGreevy, regarding vitamin and mineral questions I have specifically for my Dogues on a home cooked diet. It is wonderful that so far people have been only to pleased to help me, Cherie ,Neeki and myself are very thankful. I am horrified about what I have learned about the ingredients that ARE in most dogfoods. I hope to be able to afford your books soon! However, it was easy to download the above recipe by clicking on the recipe line. Looking forward to giving it to two of my dogs! The golden needs something for his size! thank you and bless you for all you do for our loving pets! Paula, you are soooo welcome!! Sorry to hear it Barbara, you see from the rest of the comments its unusual for a dog not to like it, but thanks for giving it a go… I appreciate that. I guarantee there are recipes in Dog Food SECRETS your little guys would love. Just wanted to about eggs. It’s not healthy to eat egg’s every day as to much colestrol, my dog has just had 4 fat lump’s removed yesterday, one was quite big. I have 2 Weimaraner’s. One is 9yrs the other is 18mths. I gave it to them today they loved it, but they love all food. Thanks for the receipe. May I ask what are your qualifications? Hi Betty, professionally I have a Bachelor of Science with majors in human anatomy and neurophysiology and minors in biochemistry and biomechanics. I also have a Masters of Applied Linguistics and speak Spanish and Japanese. The science degree is very helpful in this field but most of what I know is self-taught though my own research and involvement with many vets, trainers and dog owners over the past 6 years. I have ean 80 LB 9 year old lab who recently developed an allergy, so I’m now learning how to cook. Also, I have a 10+ old beagle who weight 41lbs. and he should be about 32lbs. I am trying to determine how much food from the various receipts to give. Any advise ? I would like to give the beagle enough, but a reducing amount so he can loose some of this weigh…thanks so much for help and comments. Holly, allergies are often related to food and simply changing to a healthier diet brings rapid relief. All of the recipes in Dog Food SECRETS come with a calorie breakdown and feeding recommendations for Toy, Small, Medium, Large and Extra Large dogs…. if you follow those recipes and guidelines you’ll definitely achieve weight loss in your beagle. Hello, I can’t get the receipe to download. Andy,thanks for your time. I live on a ranch & raise beef,pork,chickens,eggs. I have an american bulldog, border collie. these recipes you have published will help with our food buget and pets lives. My wife is eager to start making these. She knows its a start to thier health , the american bulldog has allergies and this is the reason i started looking for other alternitves. Im an elecrtician and work on a big project and have let everyone i know with pets about your video that i have come across. They are also eager to see it. Hopefully they contact you and your secret. live on with the knowlege that you are making a differance and making good to all fury freinds.